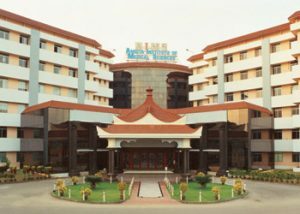 KOCHI: Amrita Institute of Medical Sciences signed a MoU with the Kathmandu-based Association of Non-Government Hospitals (ANGHOS) to establish telemedicine centers linking seven of ANGHOS member hospitals in Nepal with its medical experts in India. The wide-ranging agreement, which also involves initiatives like training and exchange programs for doctors, students and nurses, promises to herald a new era of collaborative healthcare between the two countries. The ANGHOS member institutions in Nepal which will benefit from the telemedicine service include PHECT – Model Hospital & Kirtipur Hospital; Tilganga Institute of Ophthalmology; Nepal Anti-Tuberculosis Association; National Kidney Centre; Manmohan Memorial Community Hospital; Siddhi Memorial Foundation Hospital; and Nepal Orthopedic Hospital.